Yeah, I know Father's Day was over a month ago. I am just behind on getting out stuff that we have done so far this busy summer. Heck, I still have posts to get out about the Almost Heaven South - Blogger Party, the Blue Ridge BBQ Festival, the Blount BBQ Bash, and the Porkopolis Eggfest. 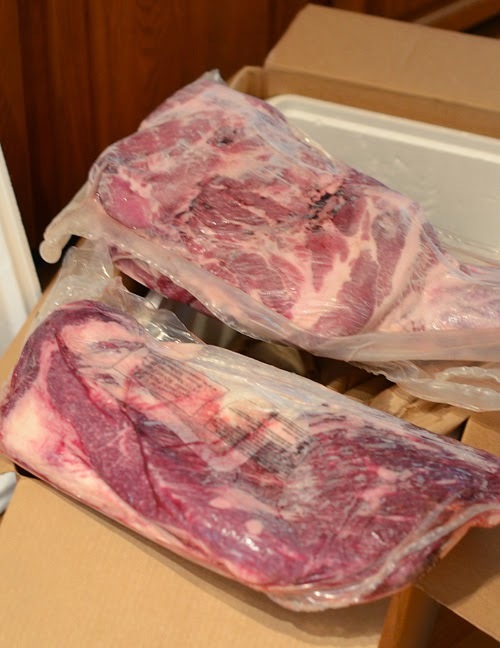 But for Father's Day, Alexis splurged and got us a Wagyu brisket and a Kurobuta pork shoulder from Snake River Farms. My neighbor, John, and I celebrated Father's Day Eve by staying up all night smoking these two beasts for a Father's Day feast with a few of our neighbors. If you aren't familiar with the term, Wagyuis essentially American Kobe beef. A lot of restaurants and vendors have claimed to serve "Kobe beef" but most are really serving Wagyu. The difference is like the difference between Champagne and sparkling wine. To be Kobe beef, the cattle had to be bread and raised in the Kobe region of Japan. If you take that same breed and raise it elsewhere, even with the exact same techniques, it is Wagyu, not Kobe. My first experience with Wagyu beef was with Snake River Farms at Kingsford University one year and they were one of these first sources of this Kobe style beef that I knew of. 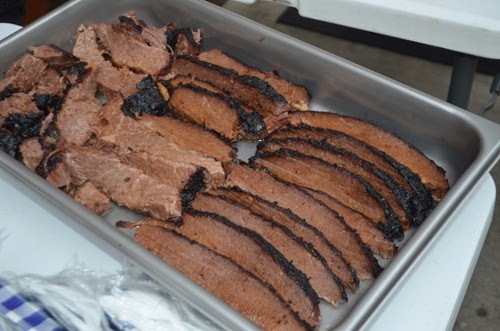 Many top level competition BBQ pitmasters rely on Snake River Farms Wagyu briskets for that extra edge over their competitors. This wasn't for competition but I wanted to serve the perfect brisket for Father's Day just the same. Ordering the meat was super easy. 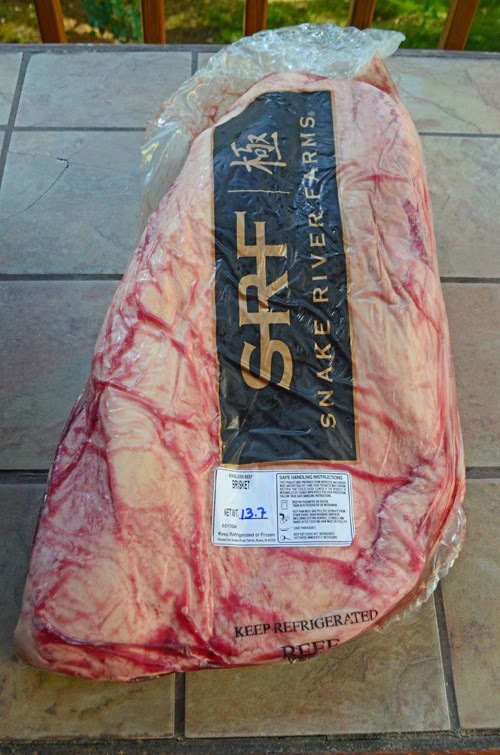 We went to the Snake River Farms website and ordered a 11-14 pound Wagyu brisket and a 14 pound Kurobuta pork shoulder. From what I understand, Kurobuta is a specialized version of Berkshire pork, but I don't know all of the details on that. A problem arose on the Wednesday before Father's Day when Alexis got home and asked where the meat was. UPS tracking showed it was delivered to our house at 3:17pm; however, our son had been there waiting for the shipment at that time and the UPS guy was never even on our street. Sean at Snake River Farms talked us down off the ledge - our Father's Day Feast wouldn't be a no-show. He got UPS involved and assured us that he was going to have another package ready to go first thing in the morning if UPS couldn't get it straight. MAJOR KUDOS to Sean and Snake River Farms for doing all of the right things to fix the mistake of someone else. UPS got several people involved and it turned out that the package was delivered to a different house number....on a different street. UPS' solution was for Alexis to drive to this location and pick up the 55 pound package herself from some stranger's door step. Bad, UPS, bad. Alexis went there and the box was still on the doorstep. Fortunately, she wasn't shot at and no "good Samaritan" neighbor called the cops on her for "stealing a package from someone's door step". Here's how the package arrived. There were about a dozen freezer packs in with the meat. 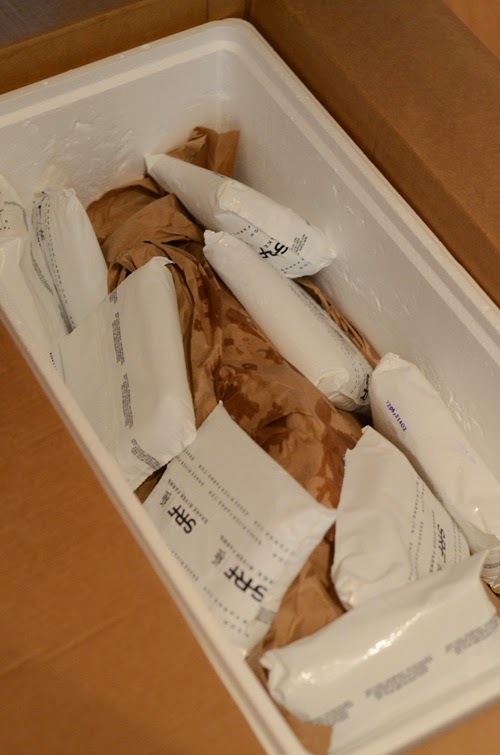 The meat was still heavily chilled, I'd say frozen, even after shipping across the country. The plan was to let them thaw for two days in the fridge and then cook them on kamado grills. With good quality meat like this, we wanted to go basic with seasonings - no injections, no phosphates, no brines or marinades. We wanted to meat to shine. 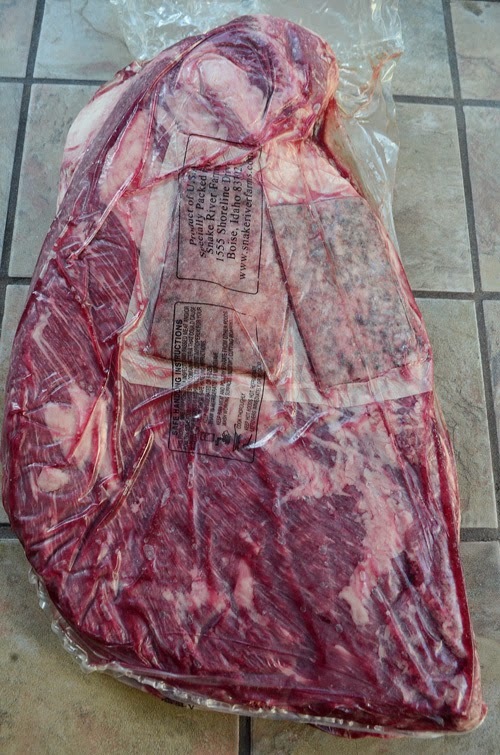 My ideal brisket is 13 lbs and this one was perfect at 13.7. 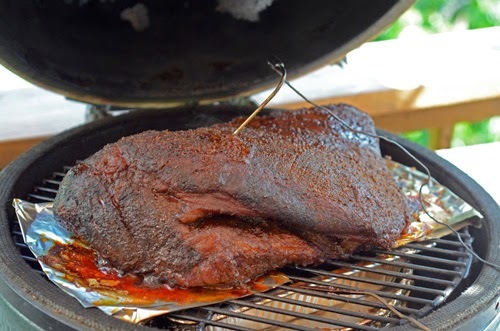 I think 13 is my favorite because it is about the biggest brisket I can fit onto a Large Big Green Egg so that is what I usually used before I got my pit. Look at that fine marbling, it's most evident in the lower left quarter. 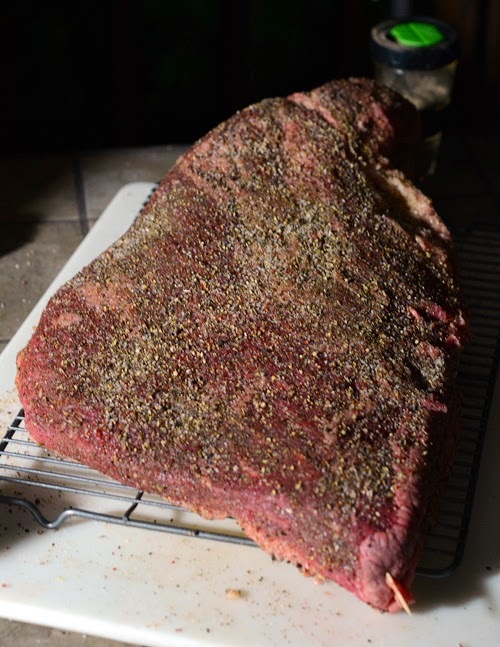 My NMT Beef Rub is my favorite for brisket. It is just smoked salt, black pepper, green peppercorns, garlic, dried onion, dried bell pepper, and oregano. That is not too much more than the classic beef rub of pepper, salt, and garlic but it adds a few more transition flavors. We used about 1 tablespoon of beef base and enough Worcestershire sauce to thin it out, as a slather to bind the rub. 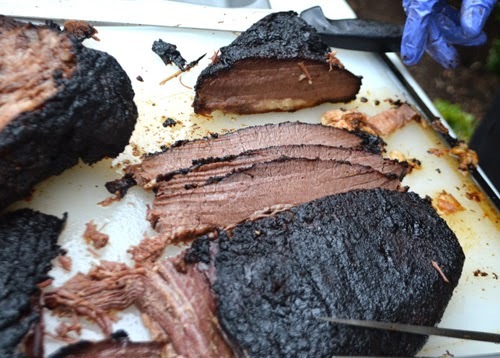 The toothpick in the lower right corner is to mark the grain of the brisket. This makes it easy to know which way to slice once it is all done and the grain pattern isn't so evident anymore. 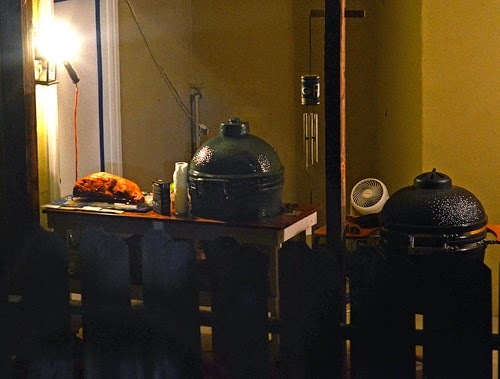 I set up my Big Green Egg for indirect cooking (plate setter in legs up, drip pan on that, grate on top of that. My goal was cooking it at 250°F until done, about 1.5 hours per pound. As you can see from the ChefAlarm, the meat was still quite cold, only 40°F, after thawing. 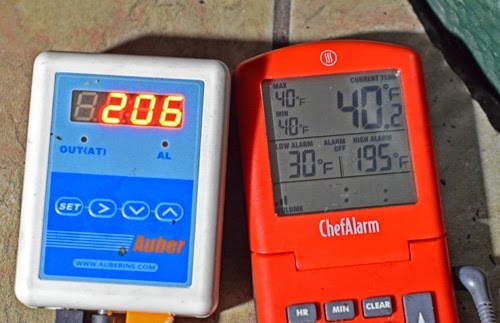 The Auber controller (left) was set at 250, this was right after opening the kamado grill to put the meat on, so the cooking temp had dropped and was on its way back to 250°F. The probe was at grate level. 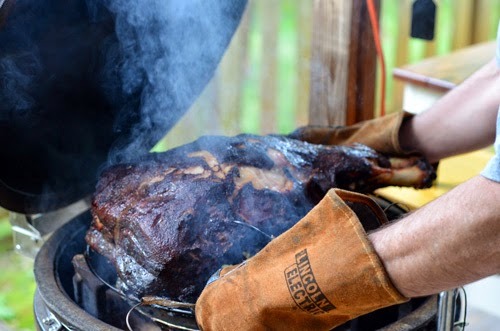 We planned to cook the Kurobuta pork shoulder on John's Big Green Egg but we ran into a slight issue with that. The shoulder was too long and wouldn't fit! 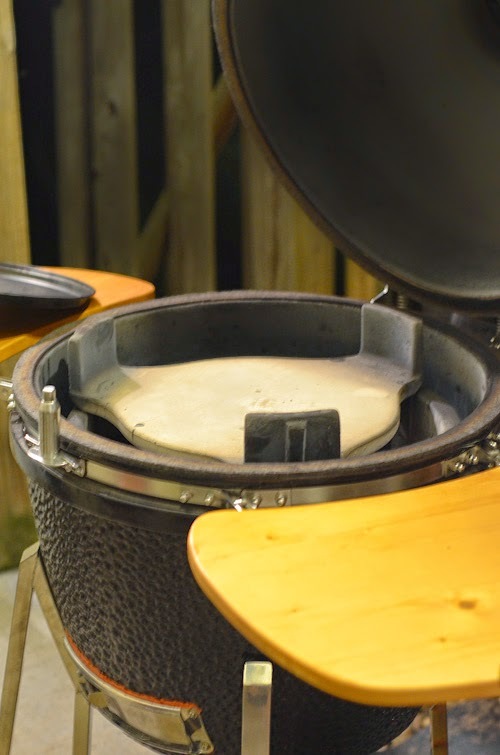 Fortunately, the exterior of the Vision Kamado is over an inch bigger but the firebox is the same diameter so Big Green Egg accessories like the plate setter still fit inside as shown. 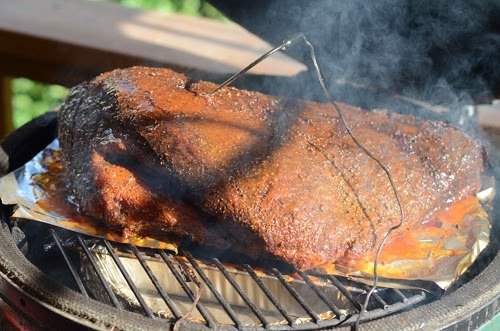 We tried it and the pork shoulder JUST BARELY fit inside of the bigger Vision. We fashioned an adapter mount for John's Auber unit to fit the Vision. 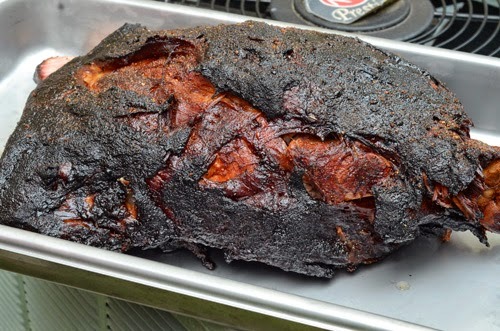 We seasoned the pork shoulder with Meathead's Memphis Dust recipe. Again, no injections or other fancy treatments. I frequently mention John and I talking so much about grilling. That is because our grilling/bbq areas face each other in the back yard. Here is his cooking area as seen from my deck. 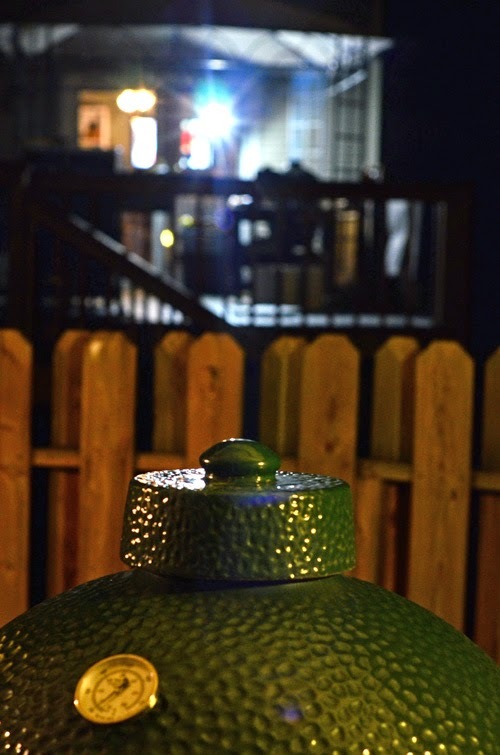 And here is the opposite view of my cooking area as seen from his side patio. So you can see how we always end up talking BBQ. So after getting the brisket and shoulder on it was time for a little sleep. 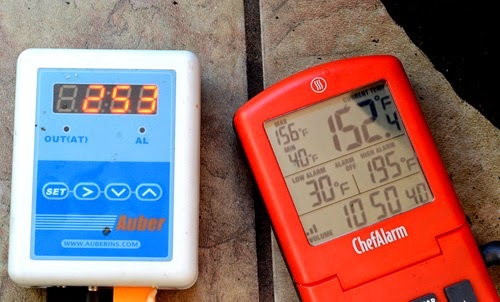 We had some weirdness with the cooking temperature readings on both the Auber and dome thermometer for the Vision early into the cook. We never did figure out what that was about, but it finally stabilized. It was acting like the probe was touching the meat and reading low but there were two probes involved and neither was touching anything. Father's Day morning at first light, our backyards smelled glorious. I mopped the brisket with beef stock, Albukirky's Duke City Sweet, and Liquid Aminos. I only mopped it twice during the whole cook, just enough to keep the surface slightly moist but not overpower the flavor. I normally do much more often with regular briskets. 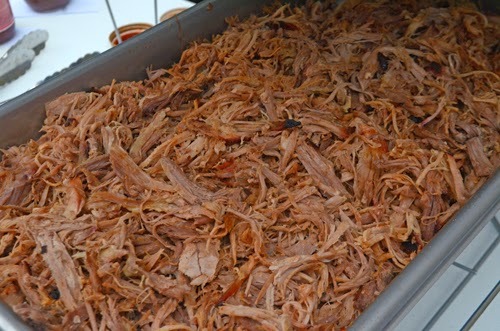 The pork shoulder was rendering a lot of fat, we had to even take it out and empty the drip pan once. Just a testament to the fat content of this gorgeous shoulder. Almost 11 hours in and my brisket is still below 160°F. John spritzing the pork shoulder with fruit juice. It was at this point that I noticed I did my brisket with the flat up. I normally do it point side up. 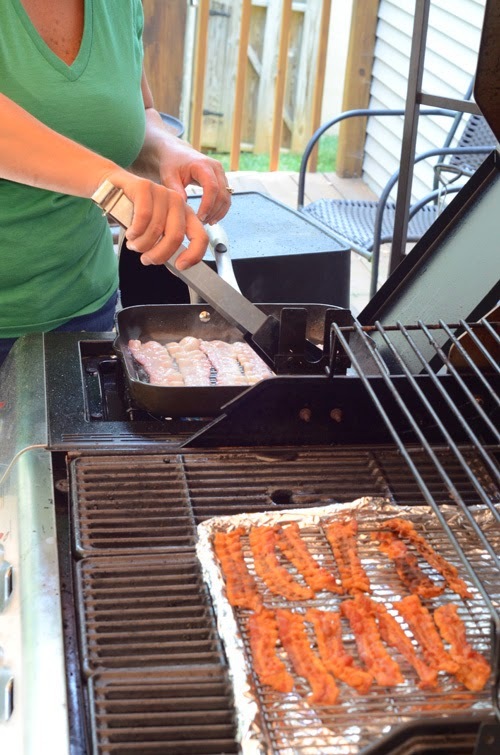 Alexis frying up bacon outside for a side dish. 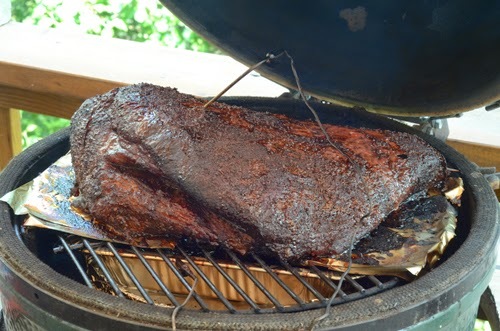 It took right at 16 hours for my 13 pound brisket to finish. That is longer than the regular briskets I do but still within the 1.5 lb per hour ballpark. Normally I'm cooking them on the stick burner at about 275°F and here I did them at 250°F on the kamado grill. While the brisket got to rest briefly, we made BBQ beans and Ted Reader's Love Potatoes on the Char-Broil TRU-Infrared Gourmet. 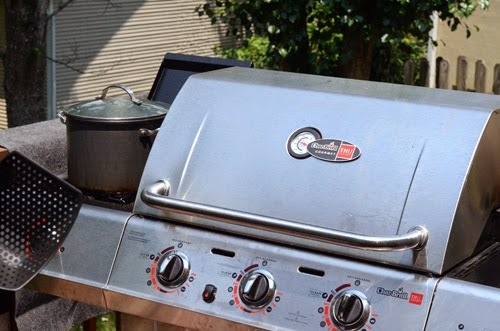 Setting your gas grill up for indirect heat at 350°F and using it as an oven is a great way to keep your house cooler on those hot summer days. The pork shoulder finished in 16 1/2 hours. This is a huge hunk o' pork. 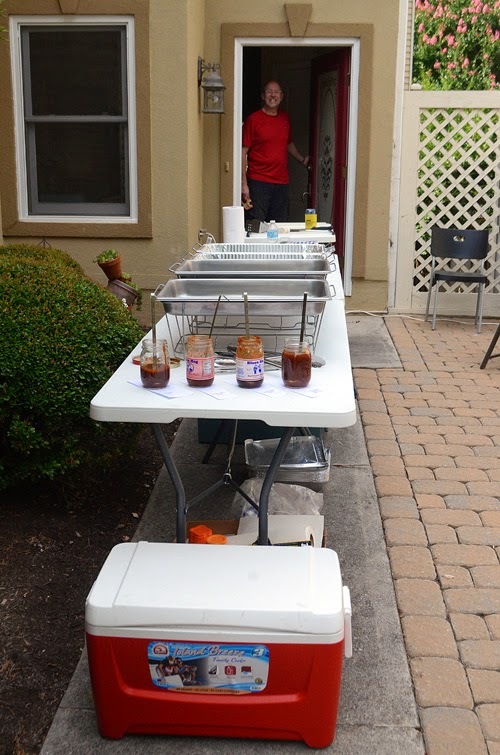 We set up a buffet in John and Anna Mae's front patio. Because the shoulder and brisket took so long, they didn't have much time to rest. 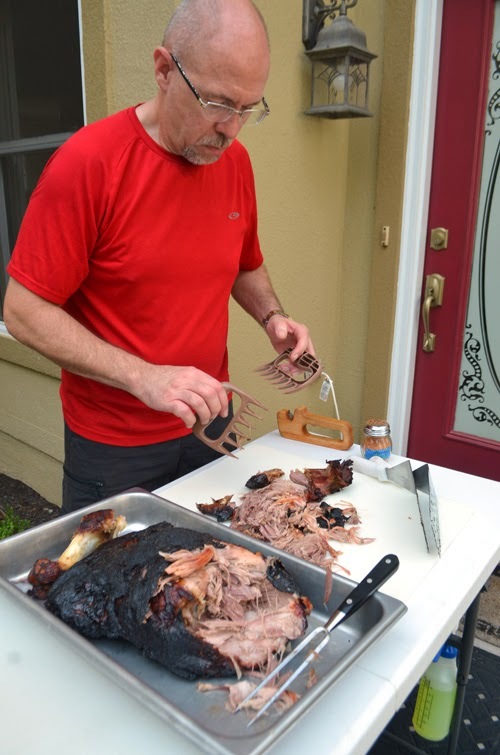 John had to use Bear Claws to shred the pork because it was really too hot to handle. We ordered insulated food gloves right after this for that reason. Next we sliced the brisket. It was the moistest brisket I have ever had, so tender and juicy that I think I heard angels sing. Or maybe that was the radio playing. Either way, it was bleepity-bleep good. The one noticeable difference to us was the complete lack of a smoke ring. This is not an indicator of smoke absorption and you could taste smoke. You can read more about smoke ring formation at Third Eye's web page. But John and I both agreed we like the smoke rings we get from using the stick burner and that's what we'll use in competition so all is good. 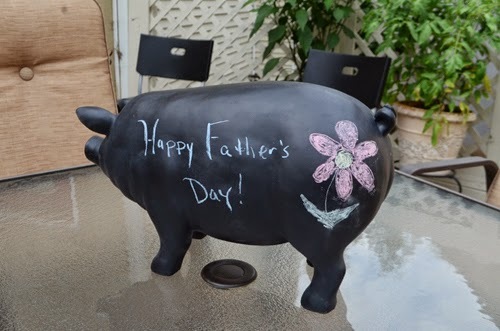 Chalk pig from our good friends, Jackie and David Scott. Alexis had this as the centerpiece. Then we had our feast. 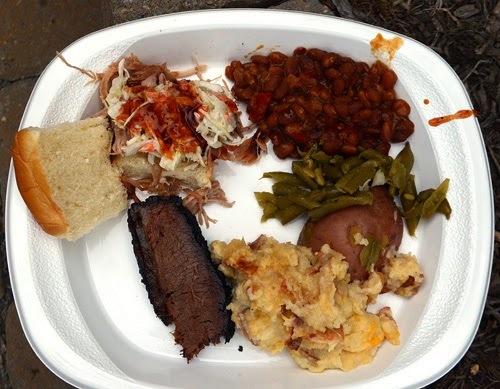 In addition to the pork and brisket, the neighbors brought sides and we loaded up. If my plate looks light, it is only because John and I had already eaten a ton of meat just before serving when we were slicing the brisket and pulling the pork. Quality control is just an occupational hazard in the world of BBQ. 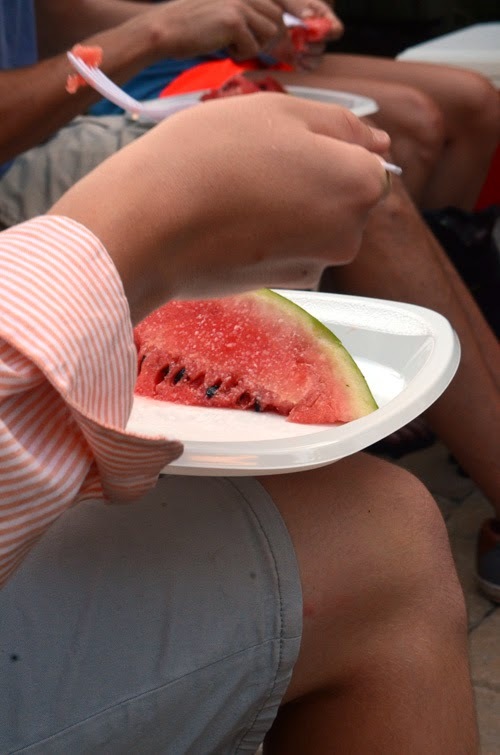 We finished the meal with cold watermelon and key lime pie. Great way to spend a Father's Day! So was the splurge worth it? 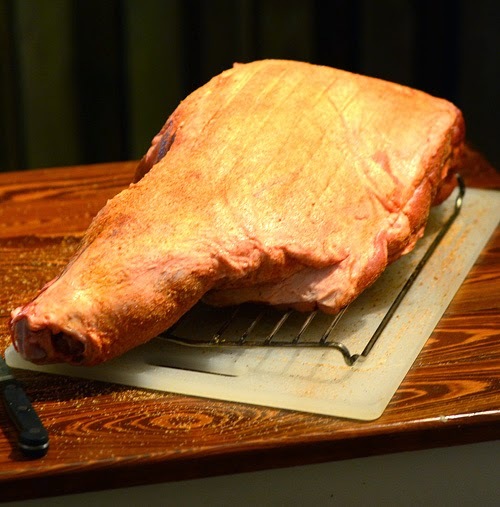 I don't have a direct comparison since it is hard to get whole pork shoulders around here so I'll have to compare the shoulder against two pork butts. You can taste a difference in the pork, for sure. I can only describe it as getting more pork flavor, like I imagine pork was before the selective breeding and hybridization resulted in today's lean commodity pork. I'll definitely use it again but I wouldn't feel that I have to buy it every time, maybe just for special occasions. 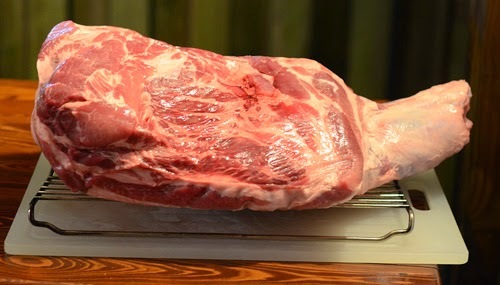 A note for kamado users: cooking a whole pork shoulder on a kamado has its limitations because it puts the thinner leg shank end right over the hotter spots of the smoker. It makes it hard not to overcook that end. Also a good bit of the rendered fat dripped down the leg bone and between the firebowl and kamado wall, making a mess to clean up. 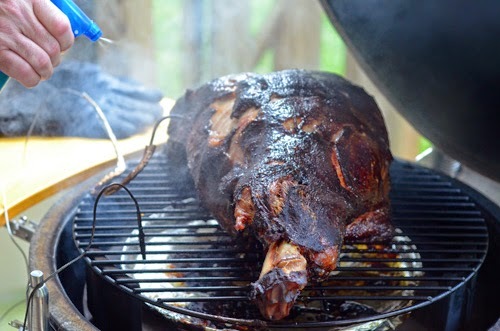 Next time I would cook the pork shoulder on the stick burner where there is plenty of room and that isn't an issue. I'll have to try it that way before I use it in a contest. Absolutely worth the difference and this is what I'll be using for competition from here on out as well as for the backyard. The texture was velvety and the taste, beefy. Our neighbors said it was the best brisket they've ever had. I consider it highly recommended and we didn't even get their best brisket, which is their Gold Grade Wagyu brisket. We were very happy with the products and service from Snake River Farms and look forward to placing our next order with them shortly. [Standard Disclaimer] I have no affiliation with Snake River Farms, received no compensation for this post, and paid full price for the product.